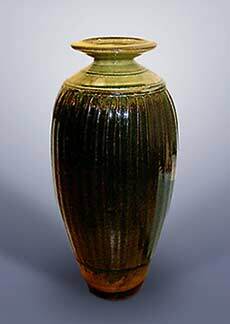 Tall Batterham vase - 24" (609 mm) high. 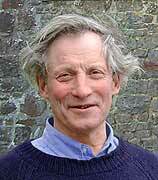 Richard Batterham, born 1936, became interested in pottery when he was at Bryanston School and learnt under the guidance of Donald Potter, himself a student of Eric Gill. When his conventional education was finished he spent a year studying as a potter at the Leach Pottery in St Ives, Cornwall. It was here that he met his future wife, Dinah Dunn, and struck up a friendship with Atsuya, son of Shoji Hamada. In 1959 Richard and Dinah set up their own pottery at Durweston, Dorset. Dinah was to give up ceramics to look after their large family. Richard built a double-chamber climbing kiln and started developing his range of stoneware vessels. In 1966 he built a larger four-chambered kiln in nearby premises. From here he extended his range, making some very large pieces. His range of shapes and glazes are kept to a minimum - a legacy of his experience of the Leach Pottery - but he is regarded as one of the finest living potters. Although he does not mark his work a few of his early works bear his initials - RB.